Happy New Year! Here’s to a bountiful year in the kitchen and the discovery of many wonderful recipes. I have to thank Linzi of Lancashire Food, the January host of Chocolate Log Blog’s We Should Cocoa challenge, for choosing the theme of “new ingredient.” What better way to start of the New Year than getting creative and adventurous in the kitchen? The rules were that you could use either an ingredient that was completely new to you or simply one that you had never paired with chocolate before. Well, pomegranate is not exactly a new ingredient to me—during the winter months when the fruit is at its peak, I spend many a morning whacking pomegranate halves on the back with a wooden spoon to extract the plump, glowing arils—but I don’t cook with it. I just eat it. The taste of fresh pomegranate arils is so splendid that I never thought it was necessary to do anything further to improve the little treasures. Perhaps nothing would ever quite equal the unvarnished glory of popping the fresh seeds into your mouth like candy, but surely I ought to broaden the scope just a bit. 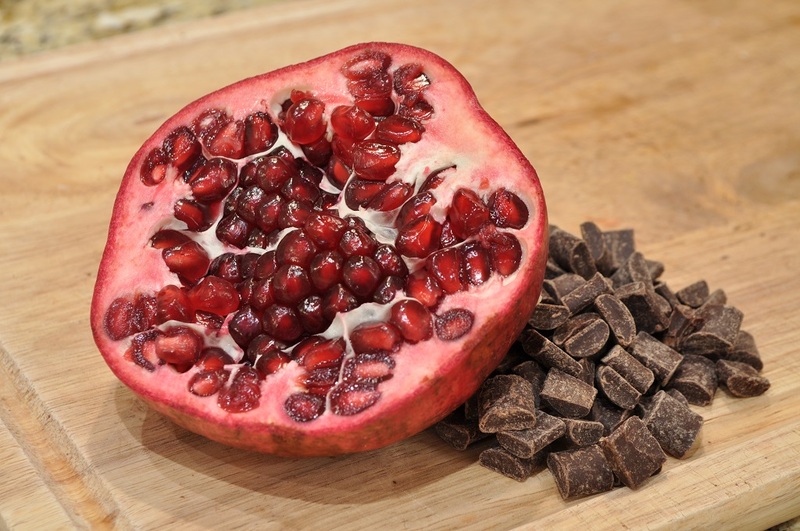 And I already knew that I liked the combination of pomegranate and chocolate. I had tried pomegranate-raspberry jellies dipped in dark chocolate at the Toronto Chocolate Festival and been suitably impressed. It was time to try utilizing the combination myself. 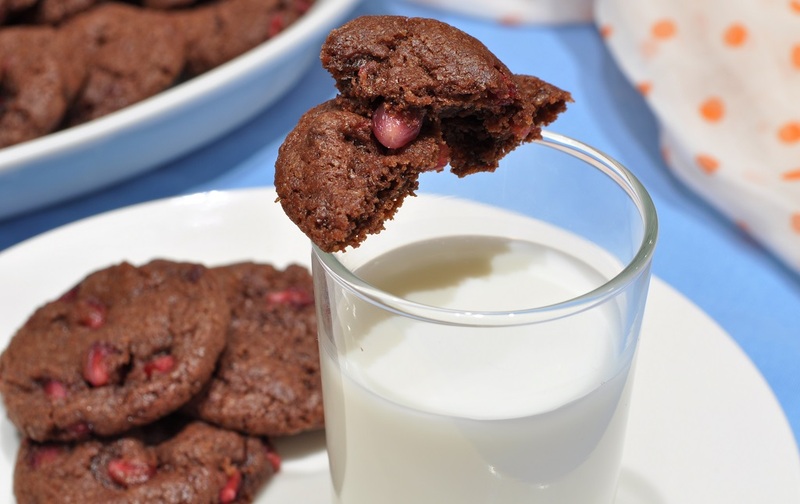 So I made these double chocolate-pomegranate brownie cookies, which turned out to be, quite frankly, equally as delectable as the fresh arils. 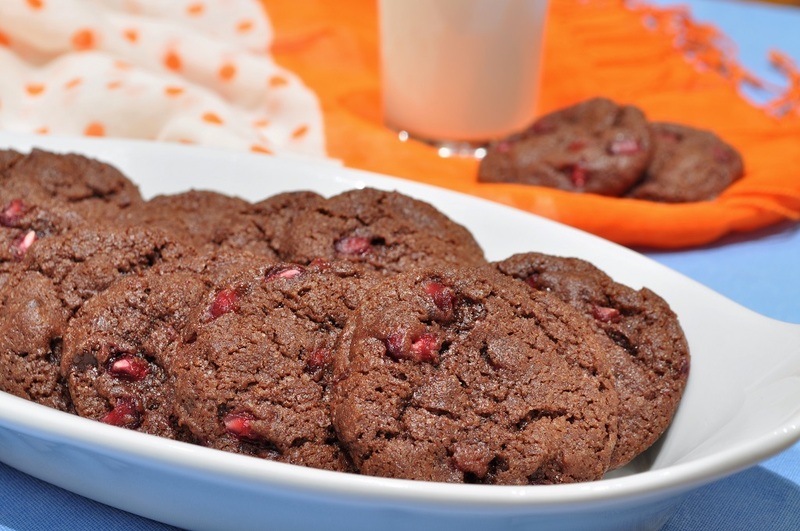 I had worried that the double dose of chocolate might overshadow the pomegranate and that baking would dull the taste of the fruit; but actually, the deep bitterness of the cocoa powder and chocolate chunks serves as a perfect contrast to the spirited flavour of pomegranate, highlighting its sweetness and letting its bright acidic notes shine. The heat from the oven almost seems to candy the seeds, intensifying their flavour rather than dulling it. The first bite I took caught me completely off guard, although in the best possible way. I had not anticipated such a vibrant result. Let’s hope all of 2014 turns out to be one pleasant surprise after another! Preheat the oven to 350°F. 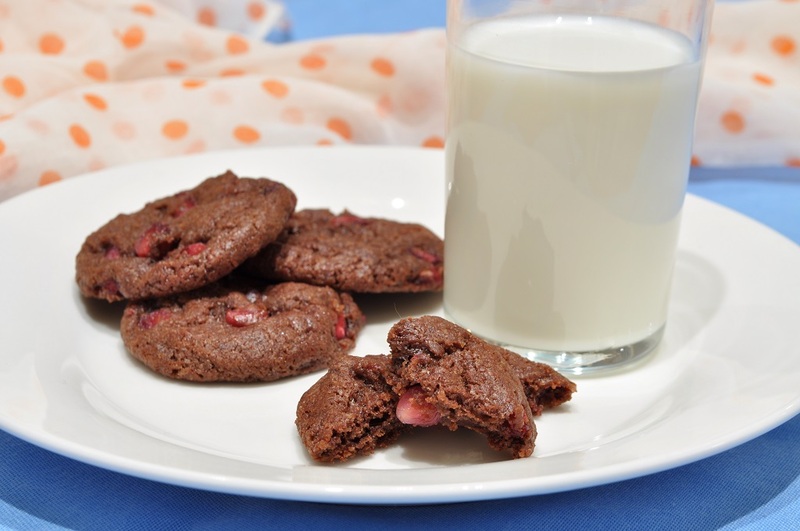 In a small bowl, whisk together the flour, baking powder, baking soda, and cocoa powder. Set aside. In another small bowl, combine the vanilla, milk, and vegetable oil. Set aside. Cream together the butter and sugars in the bowl of a stand mixer fitted with the paddle attachment. Scrape down the sides of the bowl with a rubber spatula. Pour in the wet ingredients and beat to combine. With the mixer running on low speed, add the dry ingredients and mix until thoroughly incorporated, scraping down the bowl as needed. 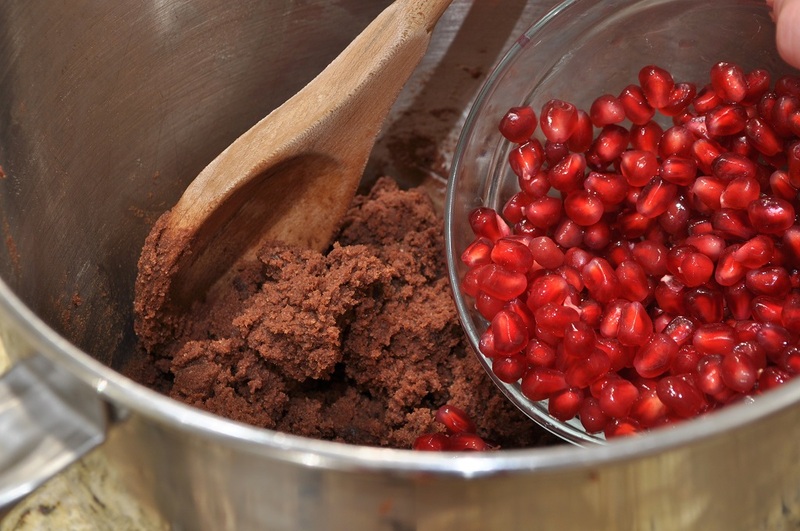 Remove the bowl from the mixer and carefully stir in the pomegranate arils by hand with a wooden spoon. 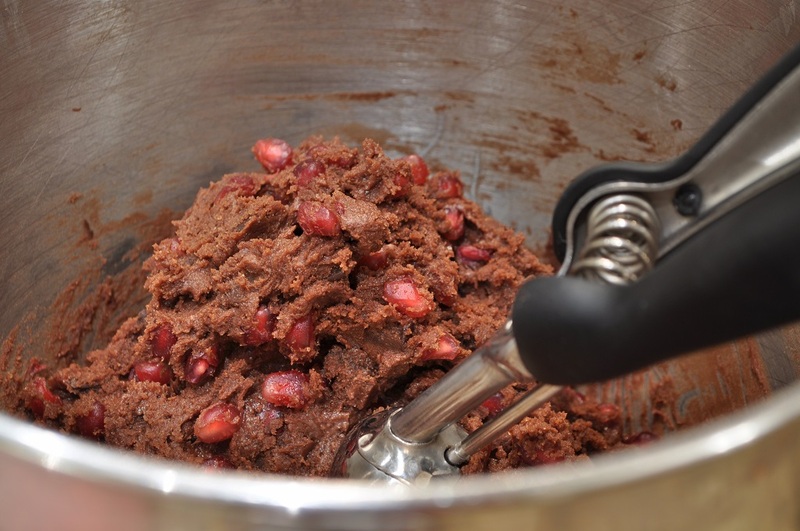 Using the mixer would crush the seeds and allow their juices to leak into the dough. 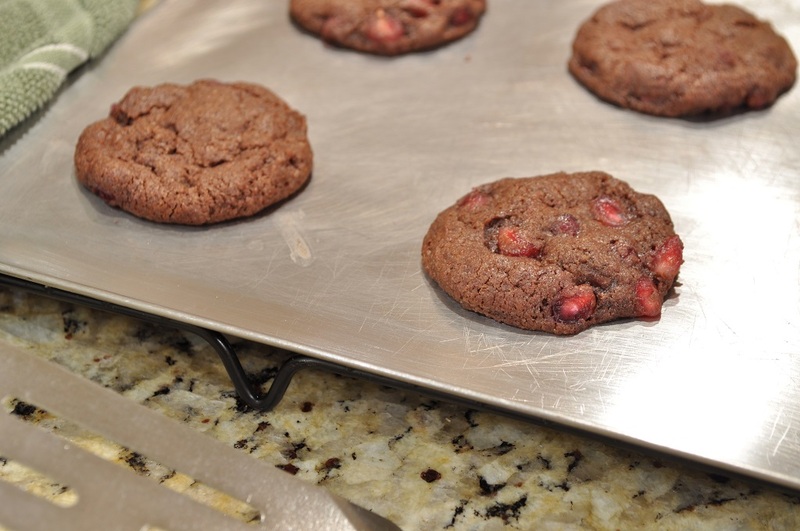 Drop the dough by heaping tablespoonfuls onto ungreased baking sheets, spacing 2 inches apart. Lightly flatten the cookies. 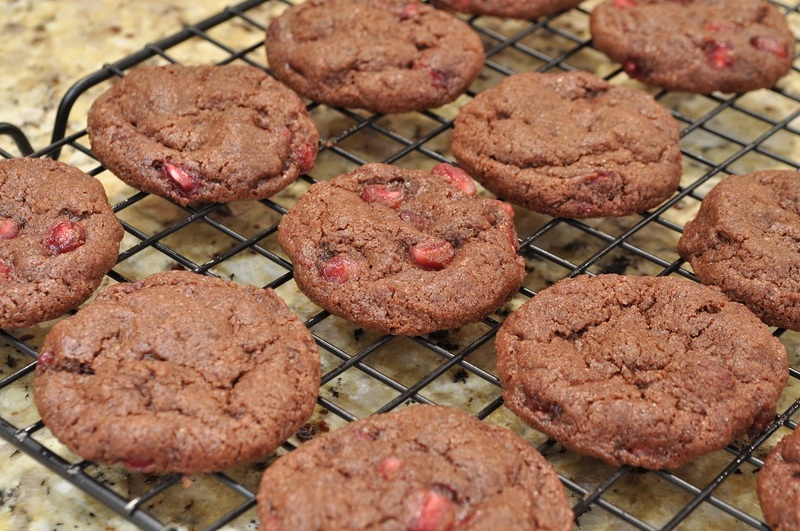 Bake until the edges of the cookies are set and their tops are puffed and cracking, 10 to 12 minutes. 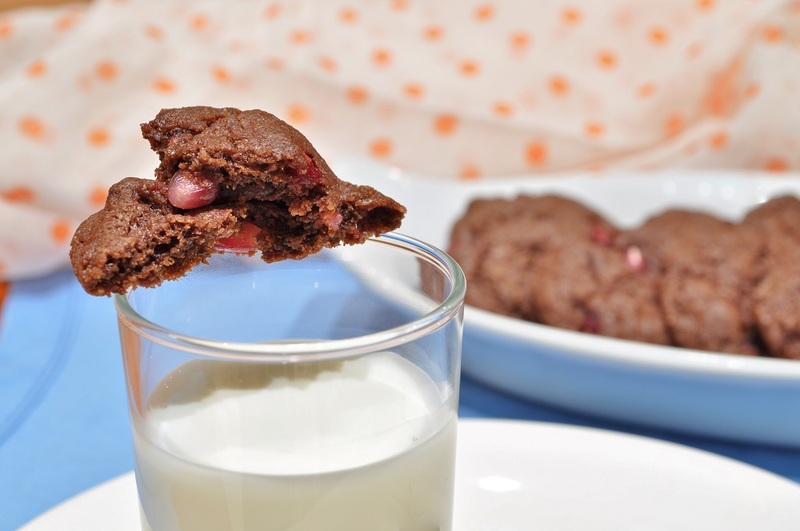 Let the cookies cool on the trays for three to five minutes, and then remove them to a wire rack to cool completely. Ooh they sound truly splendid and they look glorious too with the little red pomegranate arils peeking through. Arils is a new word for me, so quite exciting to learn. 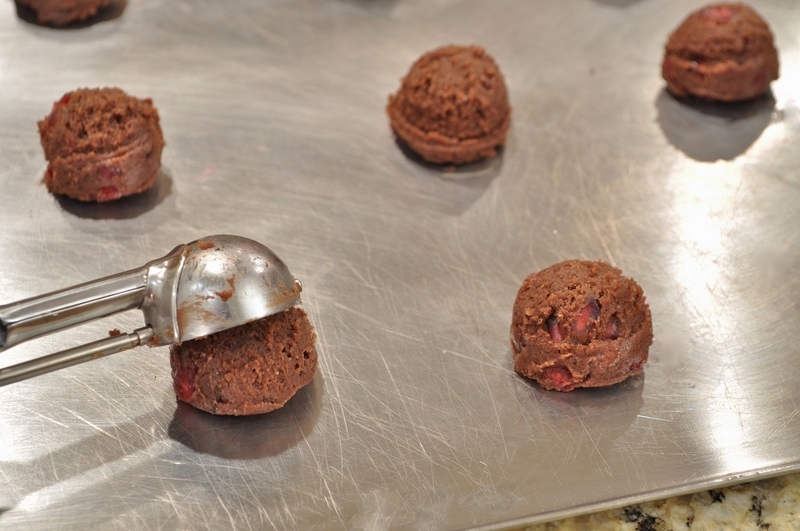 Really must get myself a scoop I can use as you’ve done – makes for a much neater cookie. 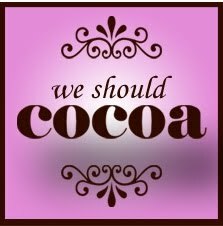 Thanks for entering them into We Should Cocoa. Yes, these were fun to photograph. Pomegranates seem made for the camera. And the cookie scoop, I admit, is my favourite kitchen gadget. I don’t know how I managed before I finally got one. 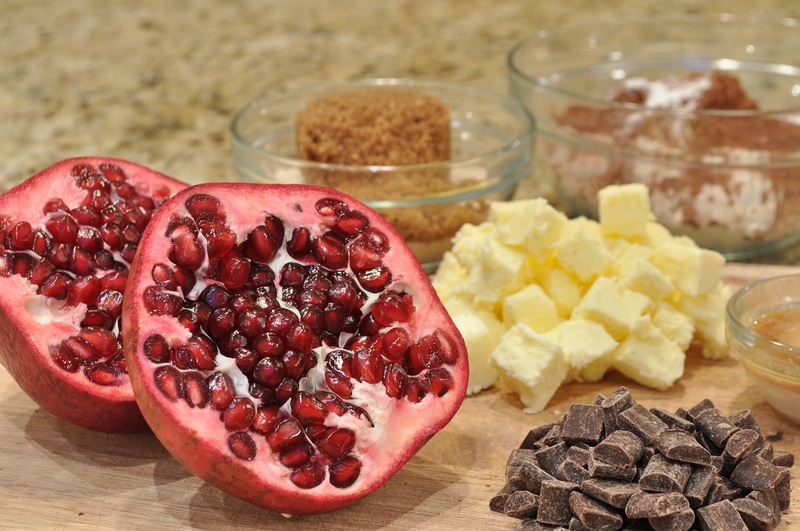 Delicious entry for We should cocoa and I love pomegranates ! My pleasure linking up; it was a great theme. Thanks for hosting! We all need a little double chocolate in our lives, don’t we?